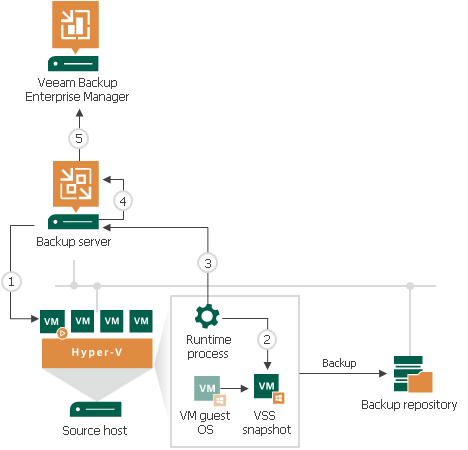 When the backup job starts, Veeam Backup & Replication connects to the VM whose file system must be indexed and deploys a runtime process inside this VM. The runtime process is responsible for coordinating indexing activities inside the VM. The runtime process starts indexing the VM file system. The indexing procedure is carried out in parallel with the backup procedure. If indexing takes long, Veeam Backup & Replication will not wait for the indexing procedure to complete. It will start copying VM data and continue file indexing inside the VM. When file indexing is complete, the runtime process collects indexing data and writes it to the GuestIndexData.zip file. The GuestIndexData.zip file is stored to a temporary folder on the backup server. When the backup job completes, Veeam Backup & Replication notifies the local Veeam Guest Catalog Service, and the service saves indexing data in the Veeam Catalog folder on the backup server. During the next catalog replication session, the global Veeam Guest Catalog Service replicates data from the backup server to the Veeam Catalog folder on the Veeam Backup Enterprise Manager server.